Ken Griffey, Jr. was seems to have been born for baseball greatness. It started from the moment he came into the world, because he was born in Donora, Pennsylvania, the same town that was the home of baseball great Stan Musial. In fact, he was not only born in the same town as Stan “The Man” Musial, he was born on the same date that Musial was. If that isn’t a difficult standard to live up to, then there’s isn’t much else that is. 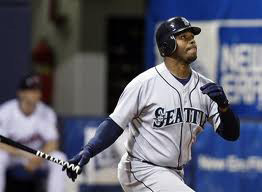 Griffey was drafted by the Seattle Mariners in 1987. He was the first overall pick that year. He would go on to spend eleven years playing for the Mariners organization. During that time he not only became one of the greatest players just as far as his stats were concerned, but he became one of the most popular players as far as fans were concerned because of his personality. During his time with Seattle he quickly established himself as one of the most dazzling players of the late 20th century. He racked up 1,752 hits while wearing a Mariners uniform. He also had 398 home runs, 1,152 RBIs and 167 stolen bases. Yes, he was a slugger and could belt the ball over the wall with the best of them, but he also established himself as a proficient base-stealer and dazzling all-around defensive player. He would end up winning 10 Golden Glove awards during his career. He set the bar high for himself the moment he put on the Mariners’ uniform and stepped up to the plate. He hit a home run that first time when he stepped up to the plate for Seattle. The first time he stepped up to the plate to play professional baseball he hit a double. 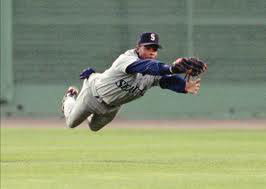 Those Golden Gloves he won were for performing in center field and he won them for 10 straight seasons from 1990-1999. He made many a highlight reel with his dazzling diving catches and his over-the-shoulder basket catches. He was also known to leap the outfield wall and steal home runs from opposing batters with ease. When he had the desire to spend more time with his family he was traded from the Mariners to the Cincinnati Reds. He was there from 2000 - 2004. He still racked up impressive numbers, but many felt that his skills were starting to decline. After he spent four seasons with the Reds he moved on to play for the Chicago White Sox and then finished his career back with the Seattle Mariners. He finished his career with a career batting average of .284. He had 680 home runs and 2,781 hits. He also had an impressive 1,836 RBIs. He also was an All Star 13 times and the 1997 American League MVP. He also was the All Star Game MVP in 1992. He also won the All Star Game Home Run Derby three times.